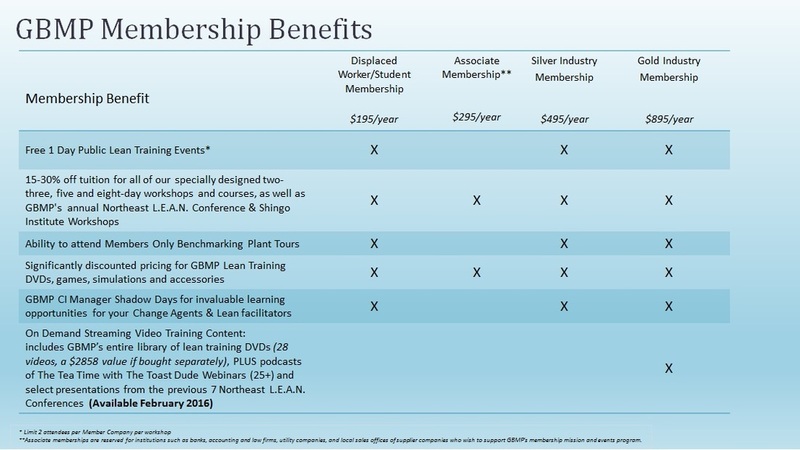 GBMP offers four levels of Membership to meet the needs of a variety of organizations and individuals. Fill out the form below to request additional information and an invoice to begin your membership in our Lean Network today, or sign up for membership online here. * Associate memberships are reserved for institutions such as banks, accounting and law firms, utility companies, and local sales offices of supplier companies who wish to support GBMP's membership mission and events program. All GBMP product re-sellers and partner companies are required to maintain an annual Associate membership.